After the Battle of Britain (summer 1940) Germany established its positions along the Atlantic and Channel Coast. The people of the occupied territories (France, the Netherlands and Belgium) had no idea how long this occupation by foreign forces would last. The only aspect which reminded them that the United Kingdom, and from 1941 onwards, the United States remained vigilant towards Hitler's Third Reich, were the daily raids of their air forces towards the industrial cities of Germany, and the military installations in the occupied territories. To counter this threat, the German Luftwaffe stationed their top gun fighter units on major air bases. In 1943, the Focke Wulfs and Messerschmitts of Jagdgeschwader 1 defended the gates of the Reich from airfields in Holland. On May 14, 1943 Willi Lück and his comrades scrambled to intercept another USAAF bomber stream. 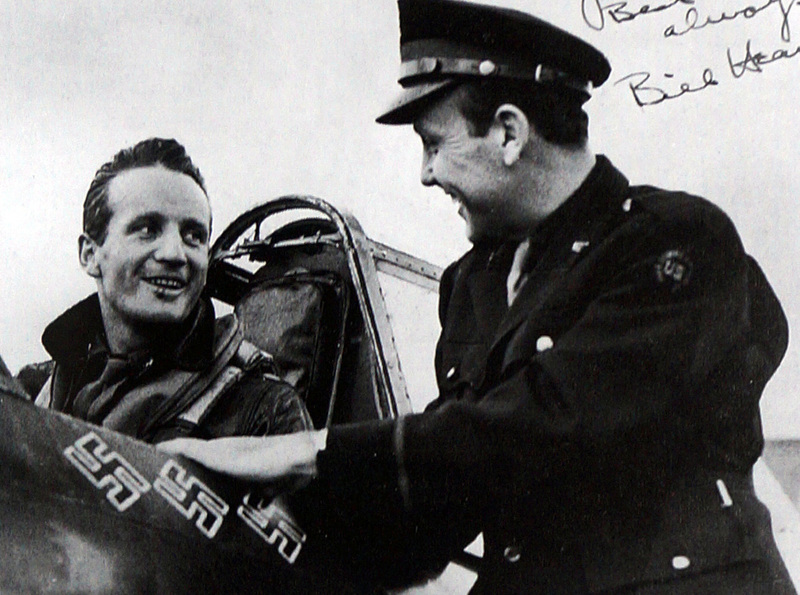 He was flying his Focke Wulf 190 “Gelbe (Yellow) 13”. American B-17 "Flying Fortresses" escorted by Thunderbolt fighters were heading for the General Motors factory at Antwerp (Belgium). Before WW2, this American motor company was building trucks and cars, and the Germans used the same installations to continue the construction of all kinds of vehicles for the German Army - many of these would be used on the Eastern Front. The German fighters were speeding towards the coast, hoping to catch the Americans before the bombs could be dropped. Near Ghent, the Staffel bounced a group of Thunderbolts and in the engagement Willi was hit by the .50 cal guns. From American archives, we learned that he was most probably shot down by the commanding officer of the 78th Fighter Group, Major James J. Stone Jr. , from Clifton, Staten Island, New York. "Ten miles before the bombers reached their target, my squadron which I was leading, was approaching the bombers from the rear right approximately 4000 feet above. A few miles off to my right below the level of the bombers I saw three unidentified fighters coming in for a front quarter attack on the bombers. I started my dive at approximately 27 000 feet. As I dove down I identified the approaching fighters as FW-190's. I followed them around towards the bombers until they were within range. I estimate the deflection as approximately 20 degrees. I gave a two second burst on the third fighter but observed no results. I increased my lead and gave another two second burst. I believe my range was approximately 250 yards. A sheet of flame burst from directly behind the cockpit and the FW-190 spun to the right. As I went by I noticed the FW-190 spinning straight down apparently out of control. I broke off the attack by pulling straight up." (extract from his combat report, stored at the National Archives in Washington DC). In fact this was the first "kill" by the 78th Fighter Group, which became one of the most succesful American combat units in WW2. Later that month King George VI and Elizabeth visited Duxford and the monarch even took place in the cockpit of Stone's Thunderbolt. Returning to May 14: From local witnesses, we know that Willi Luck must have been alive whilst his Gelbe 13 was spinning towards the earth. Due to the centrifugical forces, it must have been extremely difficult for him to get out of the narrow cockpit, but he succeeded - although too late, and too low. According to the diary of the German forces stationed in Belgium (Kriegstagesbuch) his body was found near the Bontinckstraat in Kalken, a village west of Gent, now part of the community of Laarne. Willi Lück, born in Stettin, was first buried in Gent. After the war, his were transferred to the German cemetery of Lommel, near the border with Germany. FW 190 "Gelbe 13" flown by Willi Lück on May 14, 1943. Profile by Alexander Vandenbohede. 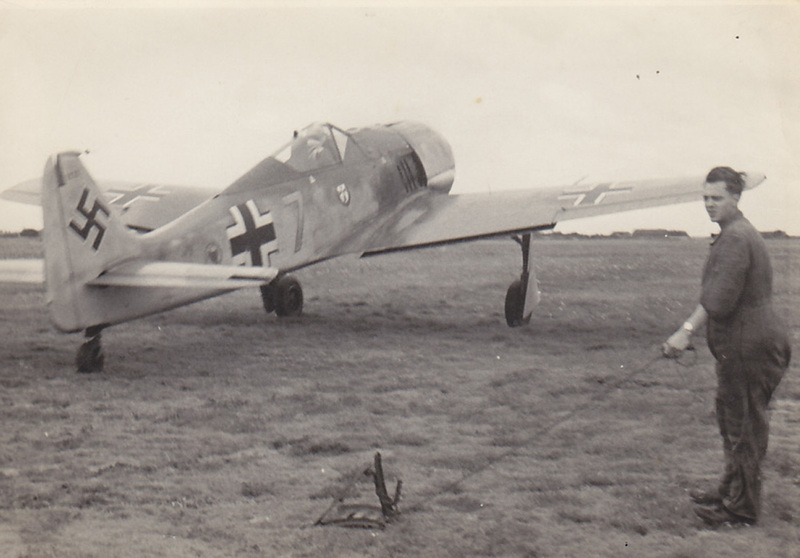 FW 190 of Jagdgeschwader 1, ready for take off at Deelen. Courtesy Jean-Louis Roba. James J. 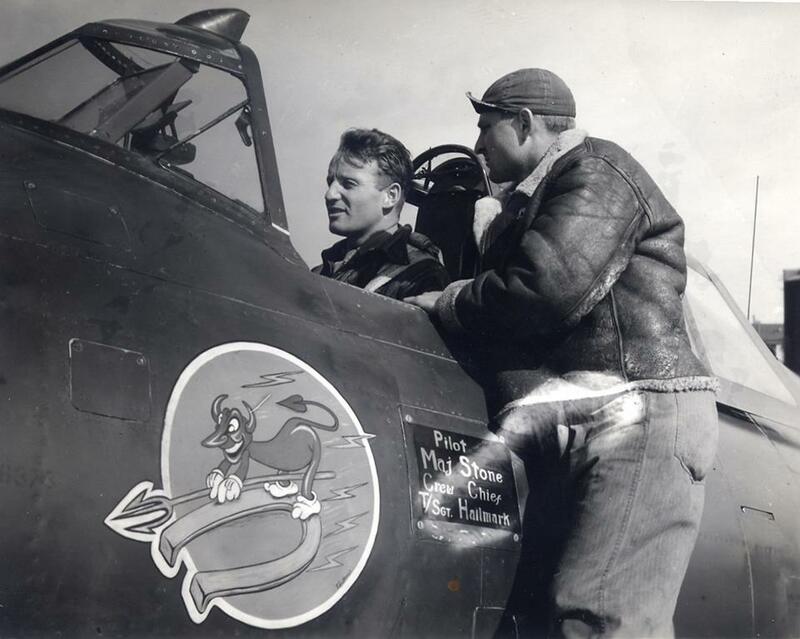 Stone Jr with his first assigned aircraft, P-47C 41-6373 HL-Z when with the 83rd Fighter Squadron and ranked Major.